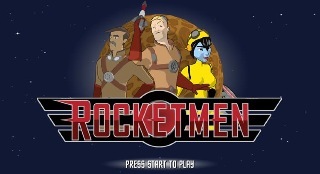 Rocketmen: Axis of Evil plays a bit like your traditional dual analog shooter, something along the lines of Smash T.V. The game does throws a few curveballs at you to help keep things interesting. For one, you can upgrade your character after each level with experience, weapons, armor and other items. In fact there's a whole RPG aspect that lets you choose and customize your character before starting off by choosing a class (Fighter, Engineer, Outcast) and a race (Human, Mercurian or Venusian). Each choice yields different starting statistics for your character. However, there isn't an experience cap, and since you can max out all the stats on any character, there's not real reason (besides appearance) to create more than one character. Rocketmen: Axis of Evil is based on a popular WizKids card game; and in doing so has yielded some pretty impressive visuals with a unique cell shaded look and comic book style cut scenes which show your customized character. I gotta say, for a game based on a kids property, there's some really great humor here. While the voice acting is nothing to write home about, it does a good enough job delivering some of the lines to make you chuckle. The story pits you as a Rocketman (or woman) against the evil Martian race who are trying to take over the galaxy. Yeah, I know...been there done that. Things remain entertaining throughout the game though, and it's definitely worth watching the cut scenes at least one time. There's a great running gag throughout the story that involves the game's characters realizing they are part of the a game. The game allows up to 4 players in cooperative mode to take on the martians. The great thing here is this allows each person to specialize in a single weapon. Eventually roles begin to form for each player, creating a sense of strategy in an otherwise chaotic world of lasers and green men. The world IS very chaotic, with seemingly endless swarms of baddies being thrown your way. It's incredibly easy to see where the Smash T.V. comparison comes into play. The game comes with a few annoyances. It took a while to figure out to use the loot vacuum to pick up those dropped items that would otherwise be just out of reach at the edge of the screen. At first the loot vacuum doesn't seem to work, this is because it's governed by your engineering skill. Some of the levels get tedious and repetitive. And, especially early in the game, your default pistol is somewhat irritatingly weak. The game is also fairly easy, even on the hardest difficulty level. There is a lot to like, however. The ability to upgrade your weapons and your character make you want to keep playing to check out how the upgrades effect the game. The experience multiplier and medal system at the end of each mission make you want to replay the missions to beat your previous bests. And the co-op lets you experience the game with different characters and friends. Co-op fun factor: Co-op doesn't really introduce any new elements into the game, but it allows each player to focus on a particular aspect (weapons, or skills) and have the group get the advantage of all the different skills. The Co-Op Experience: The game features customizable characters and up to 4 players in co-op, either online or off. Update:On May 14th, 2008 Capcom has released an expansion pack titled Rocketmen: It Came from Your Uranus for $4.95. The add-on adds 5 new weapons and 3 new levels and allows you to upgrade your character even further. Players will join the heroes of the Alliance of Free Planets in their white-knuckled, frenzied struggle to free the Solar System from the tyrannical grip of the Legion of Terra. Up to four players will be able to cooperatively shoot their way through multiple levels, powering up their weapons, picking up bonuses and laying waste to anything that moves. Page created in 1.2703 seconds.